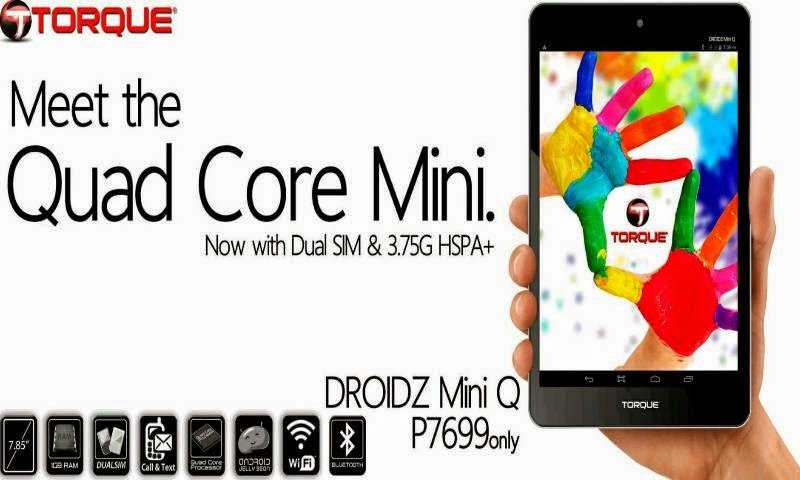 Yesterday, Torque Mobile announced on their Facebook page their latest 7.85-inch tablet named as Torque Droidz Mini Q. You may be confused with the name based on the picture above as the Quad Core Mini because they put too much emphasize on it, but then again its Droidz Mini Q. This is a good tablet to compare with other existing local and international 8 inch Android devices, but the main advantage of it for me is the dual SIM capability (call and text function) and the HSPA+ connectivity. No info yet if it is dual 3G, its screen resolution, ROM and the brand of chipset, but I will update this post once the missing details are available. Below are the initial specs of Torque Droidz Mini Q.